It was two puffs of a dandelion clock to summer. 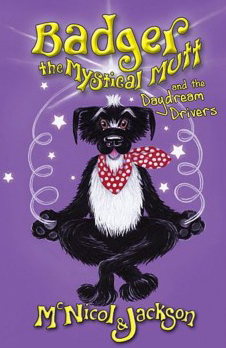 In the lane, noisy clangs and bangs, dings and dongs, rustles and bustles could be heard from Badger the Mystical Mutts garden. He was rummaging in his favourite plant pot to find the bits and pieces he needed for a very important spell. A spell to stop screeches and screams in nasty dreams. The all important spell to conjure up a magnificent Dream Catcher.Lennie, who is now leading the gang of two that is Pogo Paws and Pickle, is having terrible nightmares. Badgers Dream Catcher needs jewels from Jupiter before he can help his friend. But when they visit the Crystal Cave to find the gemstones, Nippy Nimbus sends them on a scary diversion to the Back of Beyond and on to the bumpiest ride of their lives with the Dream Dodgems. Can they escape and find answers in the Zen Den?